Pretty good tablet with good resolution. Video watching experience is awesome with Samsung Galaxy Tab 3 10.1. Camera is somewhat less in quality. Samsung with their launch of Samsung Galaxy Tab 3 10.1 of claiming themselves in making the largest tablet in the third generation tablets. This is predominantly said to be largest one in the mainstream market of tablets that are used over wide consumer market of mobile devices. The advancement of the Samsung in the tablet line up has been a steady and organic one. The Samsung has not taken any risk to take in the proprietor in the android market with their tablet range of mobile devices. The Samsung though have stated that the tablet range offers their main bread and butter, but it has been a disappointing point in the part of the users with latest release Samsung Galaxy Tab 3 10.1. The users feel that it has simply nothing to offer to its crowd puller audience, rather seems a sheer waste to launch such a mediocre product when compared to rich resolution powered Nexus 10. People would at any time deviate towards the Xperia Z than the latest released Samsung Galaxy Tab 3 10.1. At $399 price the Samsung Galaxy Tab 3 10.1 is no way a star of the show but it has all the accepted functions and definitely a brand identity which can be relied on. Good Points : The Samsung Galaxy Tab 3 10.1 is quite low in weight and has a reasonable compact look and design if one looks at its enormous size of 10.1 The classic bright resolution of the screen is quite phenomenal and the 64 GB extra storage will always add points under its belt. Drawbacks: The buttons of hit box and the back button seem to be too large for the normal eye. The touch resolution seemed to continue with its problem of errant nature. It seems like the Samsung Galaxy Tab 3 10.1 haven’t done their much needed upgraded home works on performance. The performance is the biggest setback of the device with slow down in work with every apps swapped. It can be said that the Samsung Galaxy Tab 3 10.1 is quite good on design but with its performance and function it seems to a bit on the higher end as there are much cheaper devices in the market offering better specs. 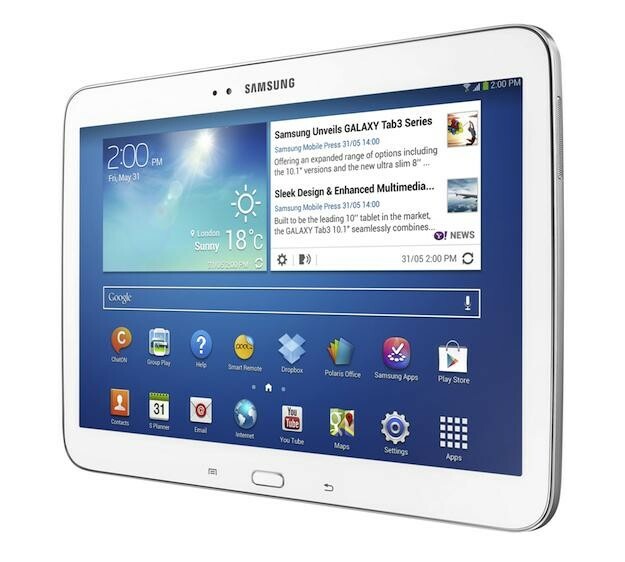 The Samsung Galaxy Tab 3 10.1 has simply made a device that is compatible in the 2012 standards. The mobile device has not made a forward march. If we look at the hardware specifications of the Samsung Galaxy Tab 3 10.1, at one point of time we may feel stunned that how come Samsung have become such lazy jacks doing copy pastes. The Samsung Galaxy Tab 3 10.1 seems to a similar copy of Galaxy Note 2. It can be that though the Note has taken over the Tab range in becoming the flagship identity of the big screens of Samsung, thus the specs were on the mid range. It clearly seemed that the Samsung Galaxy Tab 3 10.1 was launched for mid range market of users. The display of the screen is set with TFT LCD display at 1,280 x 800. This is all to sum up that no people who are gadget freaks will turn on. Though the allotment setting of the memory can be one of the touch notes that can be recommendable about this device. The device is best suited for long uses and it is 2 mm thinner than its previous models. The front edge of the screen has changed in logo centred area and has moved in the top, just beside the 1.2 MP camera. The speaker’s port does see a change as it has moved to the edge, avoiding the music to be at face. The device can be available in three different colours; black, brown and gold strips. The device though following their brand’s packaging feature is made of plastic but is quite s thinner and quite better in look and design that 10.1 tab. The resolution though bright but it lags the display quality of the Tab 2 .The Samsung Galaxy Tab 3 10.1 does not has a full proof HD coverage screen. The angles for viewing though seemed ok but the outdoor glance can be a bit of the issues. The colour reproduction will get a thumps up. It comes with latest version of Android 4.2 and equally has the Samsung’s operating system of TouchWiz in built in it. If one has pre assumed that he or she will experience the features of Note or the latest S4, and then you have to drop down. The most popular Multi Window is missing in this device. Though you will get the Buddy photo, smart stay and video players in addition with the all the apps on video players from Android store. It has the Polaris office to view in the docs and edit them from to time. Many may feel by reading the function until now, that the camera will be the area that has done some up gradation. But the disappointment seems to be on the fore front here too. The 3 mega pixels capacitive camera is quite ok for providing services. The colour used is quite balanced and the image can be detailed but the most important drawback lies here is you can use focus. They would need to revamp with their entire chipset structuring. The RAM seems to have dropped down on its storage capacity. Though the 64 GB extra storage has gained some points for itself. The battery used in the Samsung Galaxy Tab 3 10.1 is 6800 mAh. The battery is of lithium and it cannot be opened. The charger is the same of 2amp, 5v charger. After the per significant tests done, it has been seen that the battery seem to do a good job for the device. There seems to be nothing at all from the device’s point of view apart from the sleek design that can turn on any mobile device lovers. The price tag seemed a way to an ahead over the other competitor devices and the device seems to lag in the up gradation and has not advanced with the call of the hour.